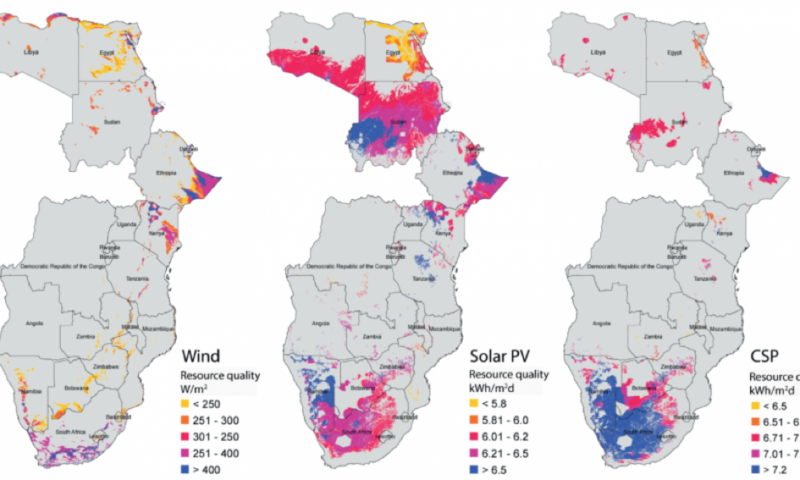 Using resource mapping tools, a University of California, Berkeley, and Lawrence Berkeley National Laboratory team assessed the potential for large solar and wind farms in 21 countries in the southern and eastern African power pools, which includes more than half of Africa’s population, stretching from Libya and Egypt in the north and along the eastern coast to South Africa. Hydroelectric power is the main power source for one-third of African nations, but it is not available in all countries, and climate change makes it an uncertain resource because of more frequent droughts. The best areas for wind and solar are not equitably distributed either, and many argue that wind and solar are too erratic and undependable. Based on the team’s analysis, however, choosing wind sites to match the timing of wind generation with electricity demand is less costly overall than choosing sites with the greatest wind energy production. Assuming adequate transmission lines, strategies that take into account the timing of wind generation result in a more even distribution of wind capacity across countries than those that maximize energy production. The team set out to tackle a key question for electricity planners in Africa and the international development community, which helps fund such projects: How should these countries allocate their precious and limited investment dollars to most effectively address electricity and climate challenges in the coming decades? The fear is that reliance on traditional hydro and fossil fuel – mostly coal – power plants will push out more environmentally friendly renewable sources in the future. The researchers developed an energy resource mapping framework, which they call Multi-criteria Analysis for Planning Renewable Energy, or MapRE, to identify and characterize potential wind and solar projects. They then modeled various scenarios for siting wind power and examined additional system costs from hydro and fossil fuels. The team concluded that even after excluding solar and wind farms from areas that are too remote or too close to sensitive environmental or cultural sites—what they term “no-regret” sites – there is more than enough land in this part of Africa to produce renewable power to meet the rising demand, if fossil fuel and/or hydroelectric power are in the mix to even out the load. Nevertheless, choosing only the most productive sites for development – the windiest and sunniest – would leave some countries with little low-cost local renewable energy generation. International transmission lines are being planned, but primarily to share hydropower resources located in a handful of countries. These transmission plans need to incorporate sharing of wind and solar in order to help them be competitive generation technologies in Africa.